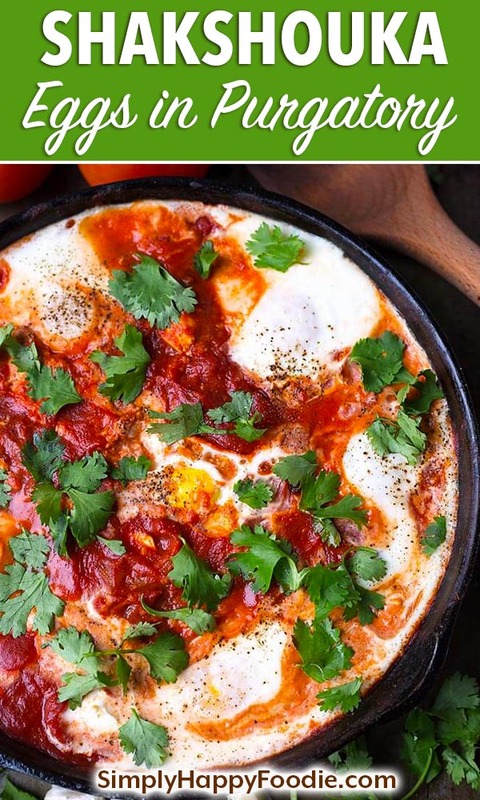 Shakshouka – Eggs in Purgatory is a Middle Eastern tomato and egg dish with delicious spices, red bell pepper, and onion. 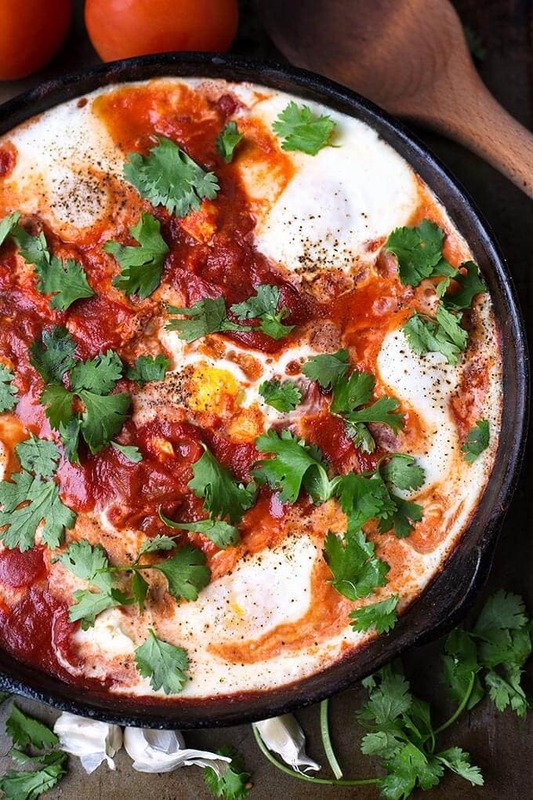 Also known as Shakshuka, or eggs poached in tomato sauce. My version also has creamy, tangy feta cheese. A great brunch recipe! I woke up this morning with a craving for this specific dish. It occurred to me that I hadn’t yet blogged about Shakshouka – Eggs in Purgatory, as it is sometimes called. Many cultures have a version of this dish, and there are debates as to where it originated. It doesn’t matter to me. I just love this stuff, and enjoy making my own version of it. Basically this dish is eggs poached in a thick tomato sauce. But it is much more than that. Onions are cooked to golden. Garlic and spices are added, along with tomato puree, and creamy, tangy feta cheese. Then the eggs are poached in this wondrous medley of flavor! It is a known hangover dish in many parts of the world! Don’t ask me how I know that! Just kidding! 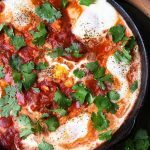 Shakshuka is a fast one-pot meal, or one-skillet meal, as I like to use my cast iron skillet to make it. It is very good on toast so you can sop up that sauce and dripping egg yolk! 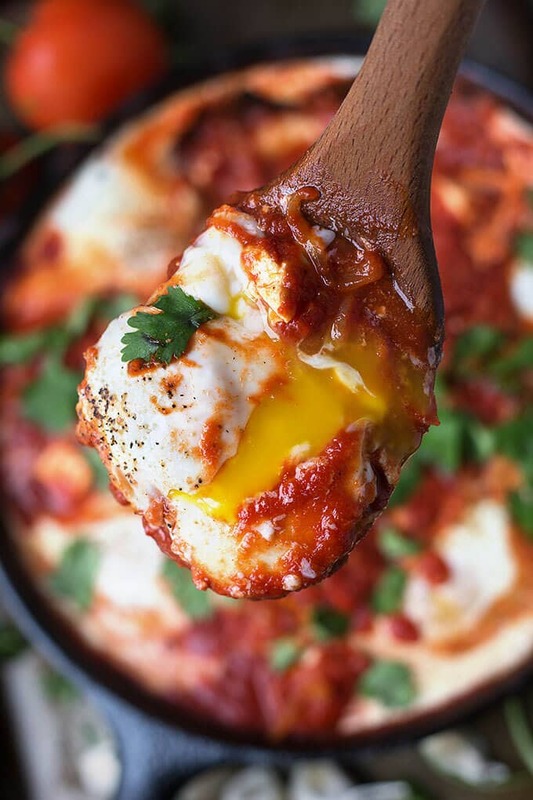 I hope you give Shakshouka – Eggs in Purgatory a try. Let me know how you liked it! Shakshouka (Eggs in Purgatory) is a Middle Eastern tomato and egg dish with delicious spices, red bell pepper, and onion. This version also features feta cheese for a rich and creamy flavor! A great brunch recipe! Heat a large skillet, medium heat, and when hot add the olive oil. Add the onions and sauté until soft and slightly golden, about 15-20 minutes. Stir occasionally. Reduce heat to med-low. Add garlic and spices. Stir and cook for a minute. Add roasted red pepper, diced tomatoes, and tomato puree. Simmer until hot and bubbling, stirring occasionally. Add the feta cheese, stir gently, just to distribute, but not to blend in. You want most of the chunks to soften in place. Crack eggs, one at a time, directly into the hot tomato mixture. Space them out evenly. Sprinkle each egg with a little salt & pepper. Put skillet in the oven for 5-10 minutes, just until eggs cook, but yolks remain very soft, like a poached egg. If you prefer to broil, just watch as the eggs do cook faster! Delicious over grits or with bread! *You can also try goat cheese, or fresh mozzarella.